So much has happened since our previous newsletter, six weeks have flown by since the opening of Kaingo Camp on the 20th of May, and Mwamba Bushcamp on the 1st of June. When you are here, out in the bush, time seems to have a different weight and measure, we were counting the months then the weeks then the days to opening, and then all of a sudden, it’s done, and every year we are surprised by how quickly it all happens. Derek and the staff did a beautiful job as usual with both our camps. Mwamba has a surprise in store for you all (photos will follow soon). 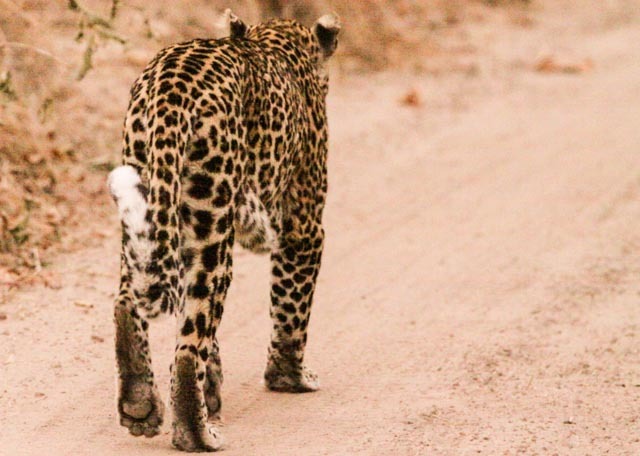 We’ve had spectacular sightings of lions and leopards this month, see below for their news! But we don’t only have cats out here, far from that. 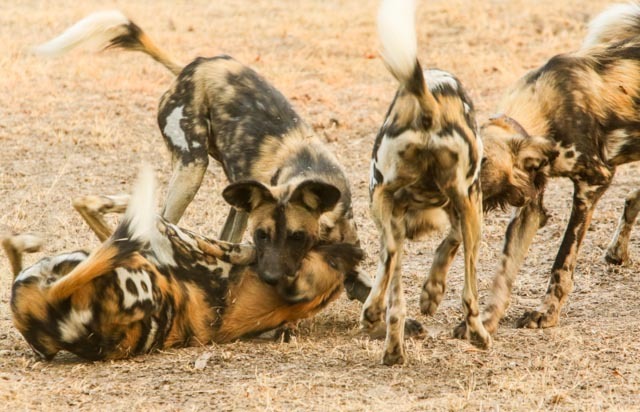 As you all know, one of the features of Shenton Safaris is our unique network of photographic hides. 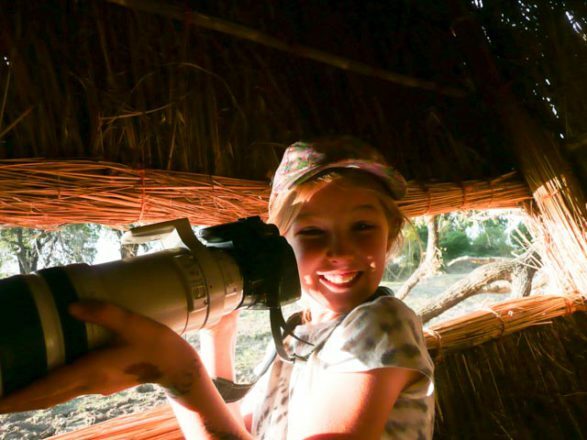 Over the years, with Derek’s ingenuity, the hides have become a standard for our keen photographers and well loved by all guests; and this season again they are proving matchless for close up observation and photography. The hides offer an added dimension to a safari, a moment where you can enjoy the variety of wildlife and birdlife without having any sort of impact on the course of nature. At this time of the season, when there is still some water inland we place our Mobile Hides at lagoons, where all sorts of animals can be observed. 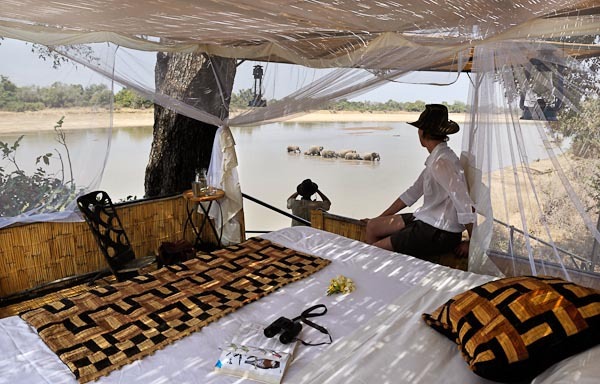 One of our Mobile Hides is currently placed out at the Wild Dog Lagoon, it is still a favourite for bird viewing, especially waders but some of our guests were lucky enough to view elephants bathing at midday. 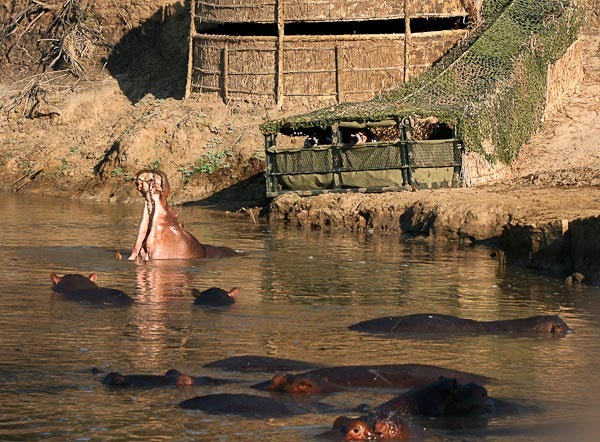 Of course, the Hippo Hide remains very popular, currently only with its higher level (the water level has only just dropped low enough for us to commence the lower level) So remember, when at Kaingo, make sure to take a midday trip to the hide, as we never know what can happen. We can also include a visit to the hides as part of the morning or evening activity of course. And some may even be used at night! I’m sure many of you heard of our Elephant Hide Star Bed. 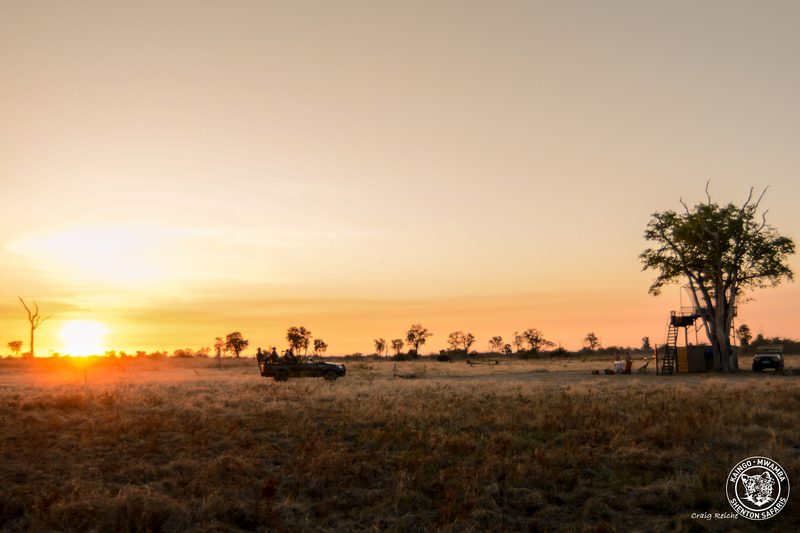 For those of you staying at Kaingo Camp, you can book a night out on the Elephant Hide, and enjoy the sounds of the African night. 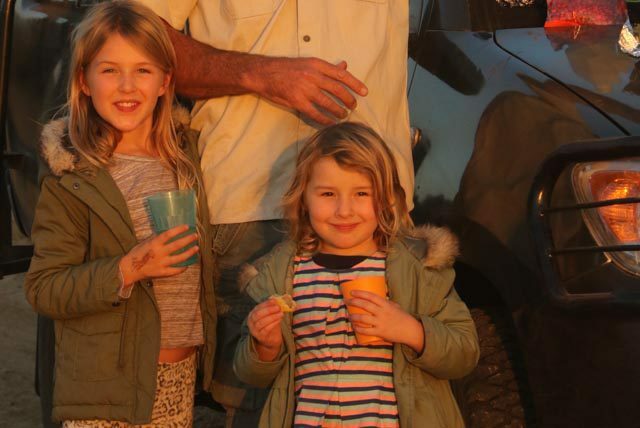 The same applies for any of you staying at Mwamba Bushcamp with the Numbu Star Bed! We’ve had several guests sleep out in these star beds already this season, and they returned delighted. 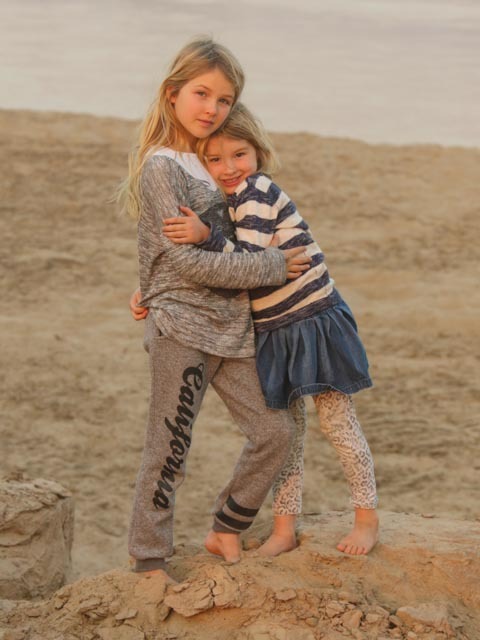 For the more adventurous we also offer a Camp Out option for one night. 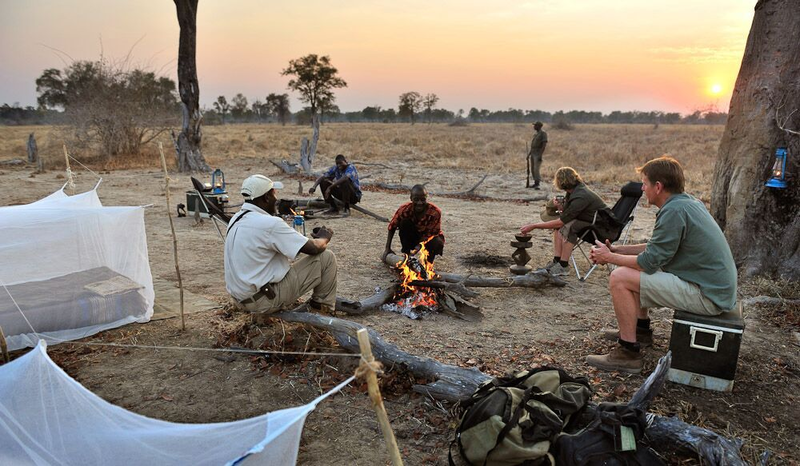 This is an incredible experience, taking you on foot to untouched wilderness, and sleeping under a simple mosquito net while the scout is keeping watch near the open fire. 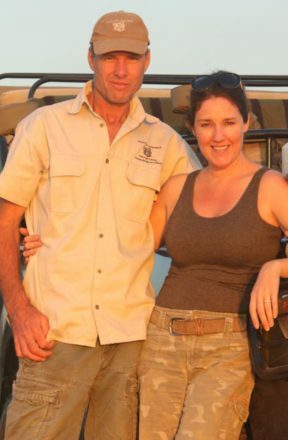 Greetings from the bush! We’ve had a great 3 weeks here with the entire family. 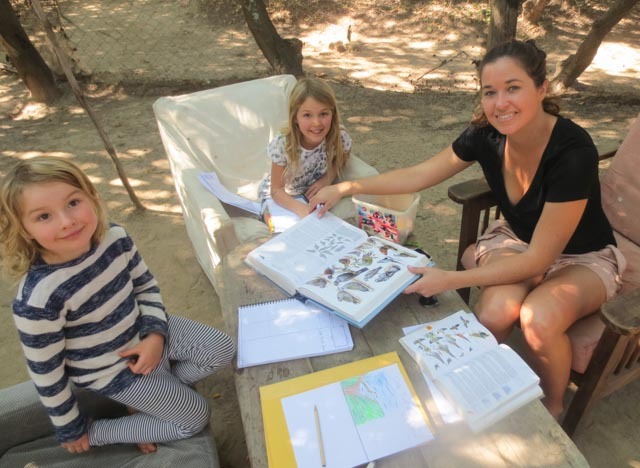 School moved to camp with us along with our teacher Miss Kia, and the girls have been enjoying units of Enquiry focussed on the flora and fauna in the South Luangwa. 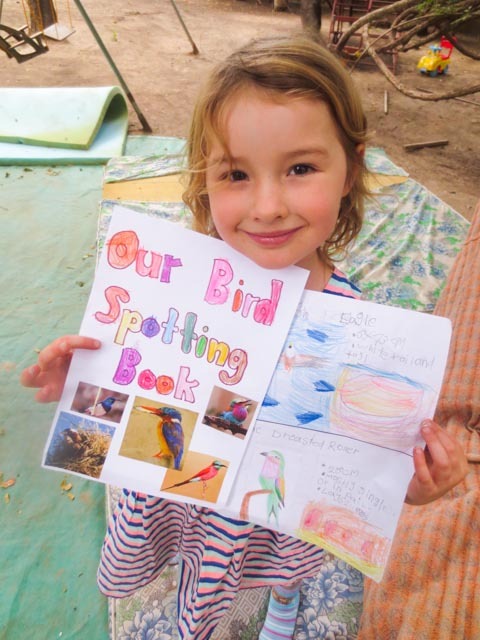 They have started creating their own bird book. 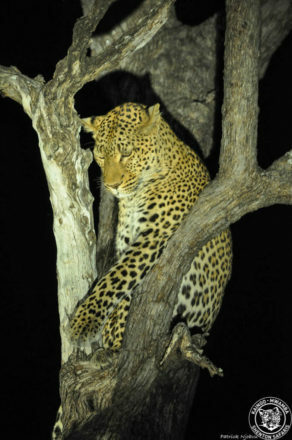 Each year Fire and Jaya become more interested in their environment. 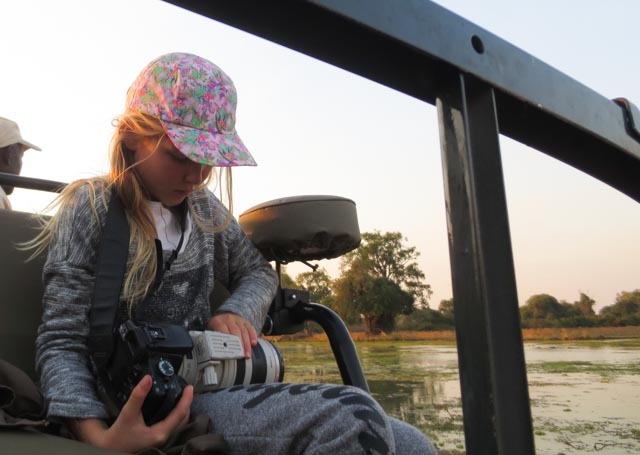 Jayabella is fairly convinced she will become a guide one day (though she is tossing up between guide and “Dolphin Dr”) and Saphire, who has been busy taking images under my guidance, is enamoured with photography. Saphire took the following images on an afternoon drive. 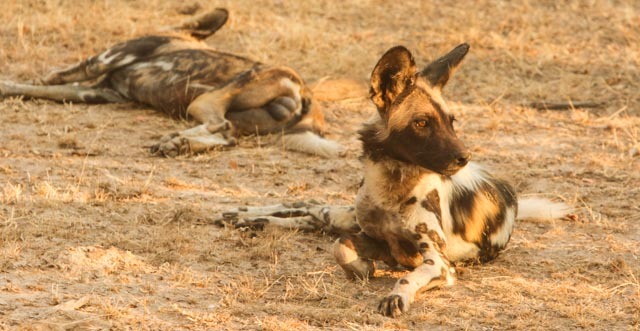 We sat with a sleeping pack of Wild Dogs for close to an hour as I taught the girls one of the key photographic lessons – have the patience to stay in one spot and work your subject! I promised the girls that their persistence would pay off and that the dogs would wake up “soon” and engage in their usual waking/greeting ritual. They were well rewarded and whilst the sweet light had disappeared (and thus the images are a bit noisy) the dogs did indeed wake and share their wonderful greeting with us before loping off down the road. 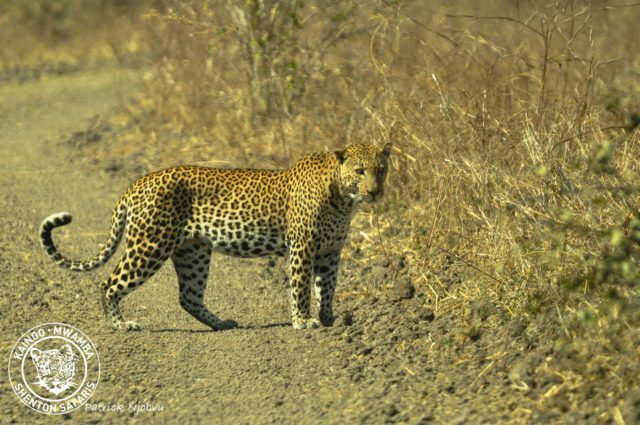 Saphire’s images of the sighting are here. Just as we left the dogs to roam, Yoram found a beautiful female leopard on the side of the road. She seemed extremely calm, but I had to hold my nerve as she walked straight towards our vehicle with very focused intent. She passed within a metre of Saphire in the open vehicle. “Stay still girls!” I was whispering. It was only later as she was walking down the road in front of us that I noticed her swinging belly. She’d been as focused on getting back to her young ones as I had been in looking after mine. The sightings have been outstanding and I know they’re only going to get better. So I’m hugely looking forward to our return family visit in a couple of months. 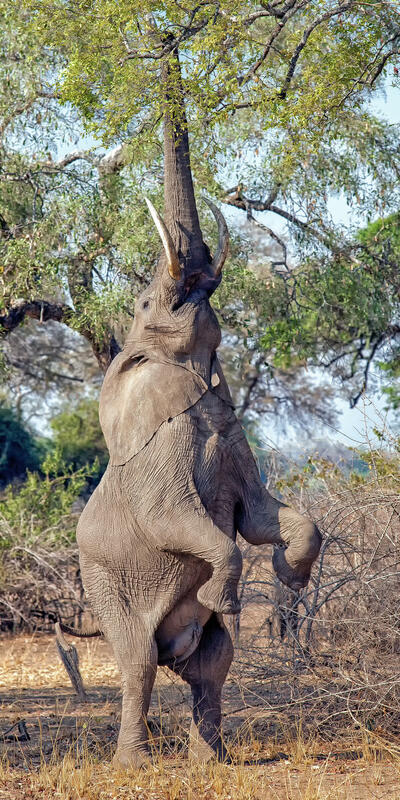 As the new season started and we returned to the beautiful South Luangwa, we were reacquainted with old friends from last season. It was lovely to meet up with the staff again and to find out their news of how they spent the previous few months. 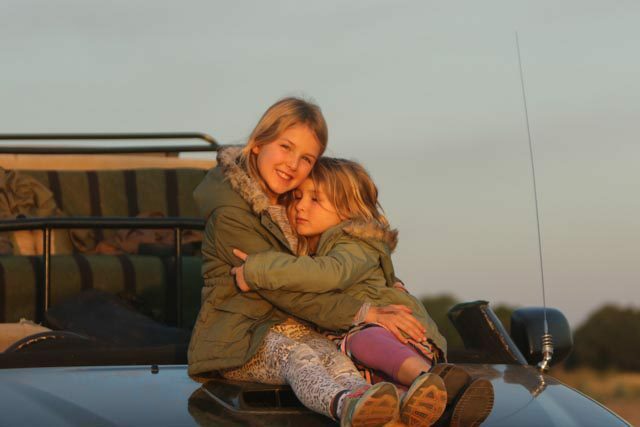 As the camp opened and the game viewing started, we all anxiously waited to find out what was happening in the surrounding bush and news of Malaika and Chiphadzuwa was high on our list . . . were the Mother and Daughter combination still working as a team or had the union split! 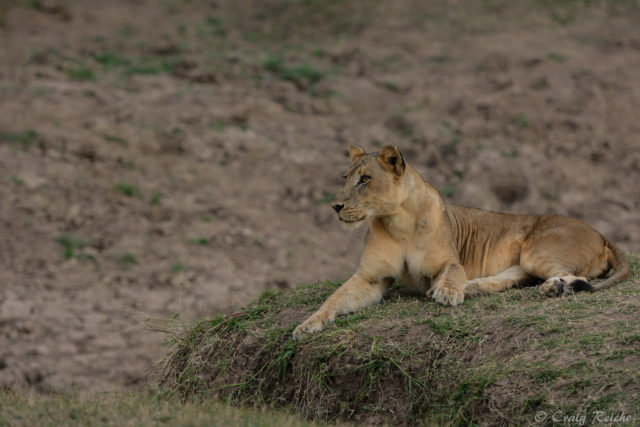 Andrew was the first to spot Chiphadzuwa and it soon became clear that she had found her independence in the months that we were away, so much so, that her (possibly pregnant) mother Malaika did not appreciate her presence nor welcome her into her company. We were delighted to see the progress Chiphadzuwa had made into adulthood and hope she will soon have offspring of her own to rear.As the month wore on, we were delighted that our suspicions (and gossip mongering!!) 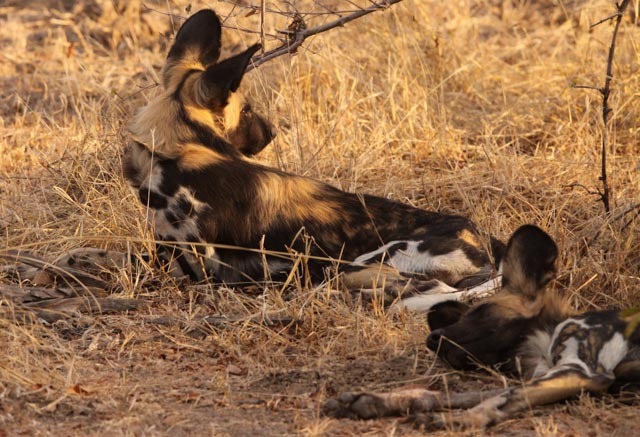 were correct and Malaika had in fact given birth to a new litter. We will be certain to keep you posted! Malaika with the characteristic loose skin swinging at her belly. 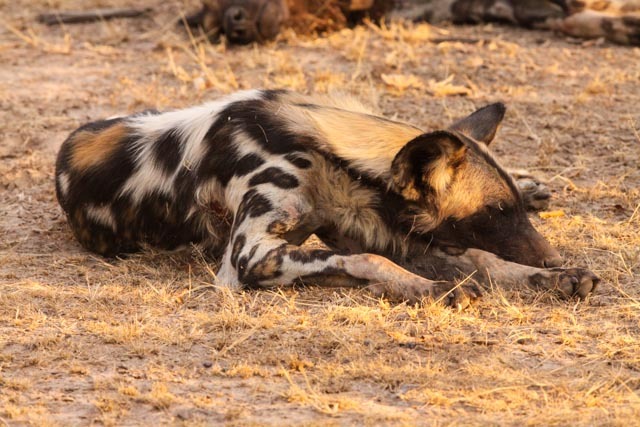 Her identifying mark is also very visible: the star-shaped group of spots on her upper, right thigh. 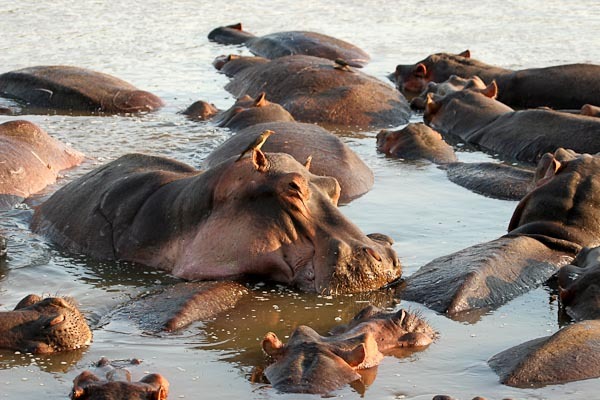 The vantage point that our office provides over the Luangwa River, offers a daily source of entertainment. 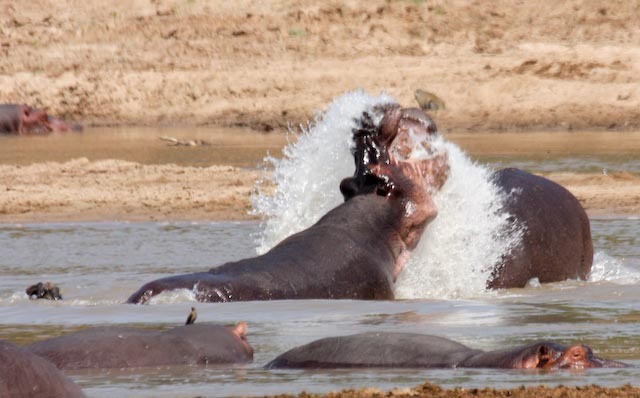 Our neighbours, a noisy pod of Hippos keep us constantly amused. One of the newest arrivals to the pod, a new-born calf of about 1-month old is a particular favourite with us. As with all young animals, it is the daily antics and adventures that keep us constantly watching! 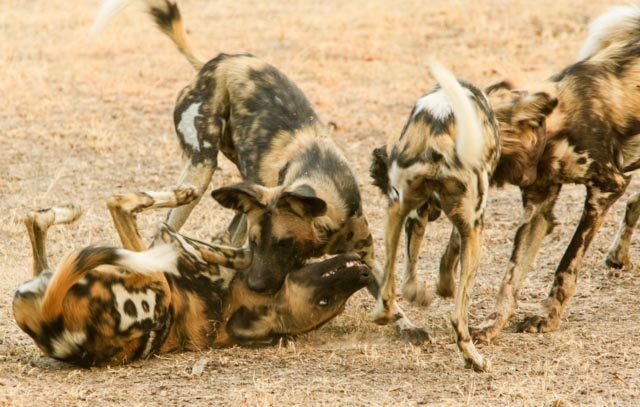 The interaction between the members of the pod and the group dynamics keep us enthralled on a daily basis. We were happy to see the 3 female bush bucks from last season had survived the rains and still visit us daily. We are hoping for a new addition there too! This month has been fantastic in watching the transformation of the surrounding bush, with each day that passes the leaves fall a bit quicker from the trees and grass begins to thin out. The remaining small water sources in the area are almost completely dried up causing more and more animals to frequent the Mwamba hide watering hole giving us a steady supply of game viewing from the camp.We have been gifted by a visit of 3 strong male lions known as the “Numbu Boys”, which reminds us of the wildness of where we are in. Almost every morning during our tea and coffee start of the day lion prides are heard calling in chorus as well as audio of leopards around the camp during the night. The warmth of the morning sun is always welcomed in the cold mornings; we are so lucky to be blessed with beautiful sunrises to begin each day. 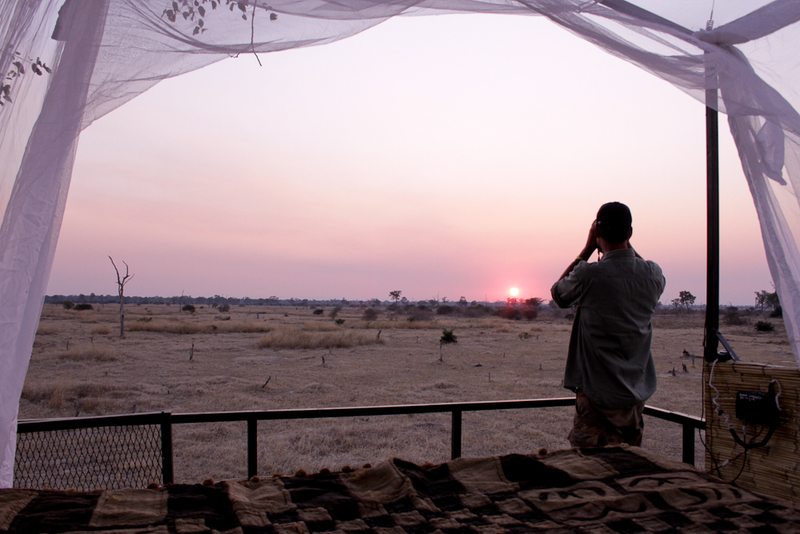 We have been able to do some sleep-outs at Numbu platform this month as well as a few special sundowner stops. Being out in the middle of the open plains with an unobstructed view to a magnificent sunset and a few hours later an incomprehensible amount of stars painted across the sky really is something that needs to be experienced. Let’s continue this newsletter by showing you a few of the sightings we’ve had so far. This month has been prolific for all the carnivores that we share this beautiful land with. 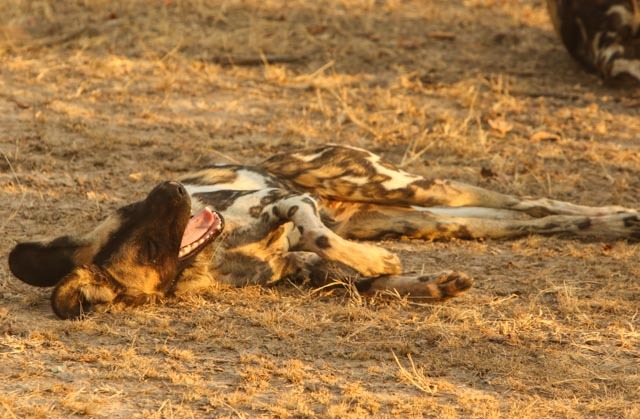 The wild dogs have shown themselves late into the month, some of you were lucky enough to see them hunt, others to see them play, others still to watch them lay in the shade of trees on a hot day. 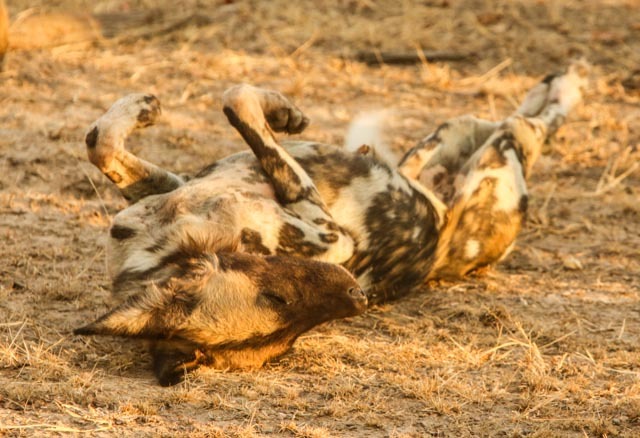 They truly are amazing creatures to observe, and every time they move “Painted Dogs” just seems to fit them so well, they are just like fluid oil paintings dancing along the plains. The opening of our season with lions in camp seems to have set the tone for our sightings so far. We have sighted the Hollywood Pride on several nights hunting smaller game. When they did catch larger game (a buffalo mid month) they were pushed off their kill by Kapiri, our resident King of Thieves. Since their pride currently has younger lions, they are quite vulnerable to a big male lion, it is the third time so far since we’ve opened that they have had their kills stolen from them by him. The Hollywoods kept meeting up with Patrick and his guests three nights in a row for sundowners, cutting into drinking time, but I’m sure Pat and his guests will all tell you that it was well worth it! Read here about the exceptional night with the Hollywoods, Malaika and Chipadzuwa. We have sighted the Nsefu pride, feeding on a Hippo on the river bank They are thriving, with several cubs of different ages groups all doing fabulously well, it’s always a success for a pride to be able to sustain several youngsters together. The Nsefu males Tangua and Nyuma are still as gorgeous as ever, their manes a little bit darker than last year, just adding to their charm. With the water levels a too high for them to come across from the Nsefu side, and the fact that the Numbu Boys are now covering this area leads to believe that there could be epic battles to come, only time will tell. Leopards have not been as shy at all, and have spoiled us with their presence, as many as 5 different leopards all in one night. They are unpredictable, whilst Shy Girl and Shy Boy are skittish, Luambe surprised us this year by being extremely relaxed with us observing, unusual behaviour for him. Tyson, Elliot, Chipadzuwa and (specially our favourite) Malaika always allow for lengthy viewing, with beautiful photographic opportunities. Our next newsletter will come at the end of July. Most of our blogs are written by our guides, they are out and about with guests all day (remember we have three activities a day rather than the standard two), so they have a lot to share with you and the blog serves as a great representation of what you can experience whilst with us, so you will get the day to day essence of a safari with us. The Shenton Safaris’ Big Cat Roundup has been launched so that you can stay in touch with the beautiful feline characters that you have come to know and love whilst with us. 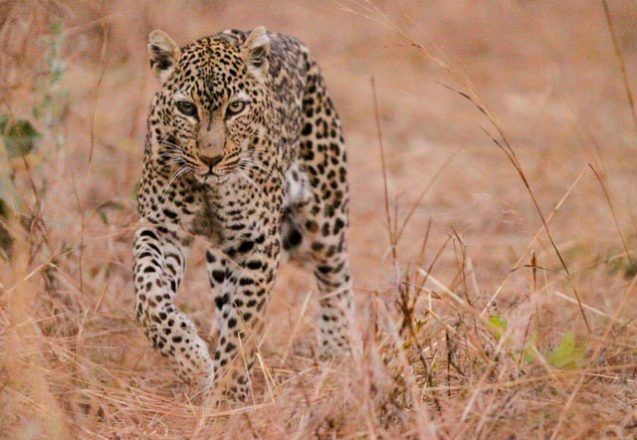 Whether you’ve seen the female leopard Malaika and her calm nature playing with her young, or watched Kapiri the head strong male lion feast on the Hollywoods’ kill, this “Diary” blog is here to keep you up to date with their endervors.